The maker of rechargeable $103,000 Karma sedans told a "core group of employees in Southern California" yesterday of the plan and expects about 25 percent of workers to stay, the Anaheim, California-based company said in an e-mailed statement. Fisker had about 200 employees prior to today’s action, the company said last week. "Our efforts to secure a strategic alliance or partnership are continuing in earnest, but unfortunately we have reached a point where a significant reduction in our workforce has become necessary," the carmaker said in the statement. The cuts are a "strategic step in our efforts to maximize the value of Fisker’s core assets," the company said. Troubled started last year when Fisker’s car battery manufacturer, A123 Systems Inc., filed for bankruptcy. 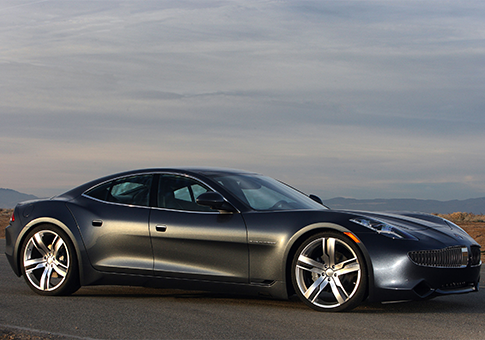 As a result, Fisker suspended the production of Karmas. A123 was then bought by a Chinese firm and renamed B456 Systems Inc. Fisker received a government loan totaling $529 million in 2010 for its luxury plug-in cars. Fisker, founded in 2007, has sold about 2,500 plug-in cars. The company has said it was seeking investors to raise funds for a second model, the Atlantic, to be priced lower than the Karma. This entry was posted in National Security and tagged A123, B456 Systems, Big Labor, Federal Bureaucracy, Fisker, Obama Administration, Obama Economy. Bookmark the permalink.